Google has recently brought together resources with Google Earth to track the devastating oil leak in the Gulf of Mexico that is pouring as many as 5,000 barrels (210,000 gallons) of oil a day into the Gulf and poses a serious threat to coastal industries, sensitive habitats and wildlife, including numerous species along the coastal areas of Louisiana, Mississippi, Alabama and Florida. 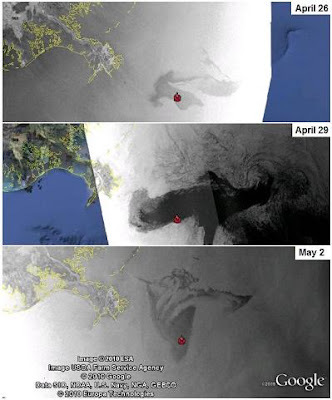 Using NASA’s MODIS available as an overlay for Google Earth, it shows the extent of the oil spill through April 29 as well as using radar images from ESA’s ENVISAT available. Below, are images of the progression of the spill over time. In addition to this imagery, the Google site contains maps of the locations of the oil, fishing closures and affected areas, the ability to upload videos directly to YouTube, and a link to a site where people in the area can contribute their observations. These resources might be useful to those affected by the spill, those responding to it and those learning about its devastating effects on the people and environment of the Gulf Coast.